↑ 1.0 1.1 1.2 1.3 1.4 "Search Results for: Garra rufa". Global Biodiversity Information Facility. สืบค้นเมื่อ 28 June 2010. ↑ 2.0 2.1 2.2 2.3 2.4 2.5 2.6 2.7 Zicha, Ondřej (2009). 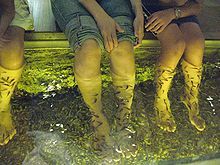 "BioLib - Garra rufa". BioLib. สืบค้นเมื่อ 28 June 2010. ↑ 3.0 3.1 “Doctor fish”. In New Scientist magazine: The word 14 July 2007. Page 52. หน้านี้แก้ไขล่าสุดเมื่อวันที่ 23 สิงหาคม 2556 เวลา 18:03 น.